Get a Fast and Free Quote on Custom Desk and Office Supplies for your Event or Business Today! Dress up the desks of any VIPs in your network with our wholesale desk and office supplies. 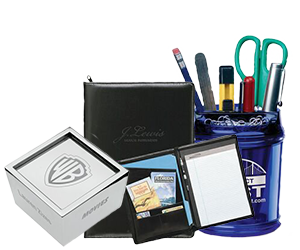 These custom promotional products are perfect for valued customers, preferred vendors, and top-performing employees. It's the surefire way to make a lasting impression and showcase your company at the same time. Add your logo, message or other details to create personalized promotional items that recipients will see and use every day. Whatever your budget for branded merchandise, Gallant Gifts stocks custom office supplies and desk accessories in every price range. From practical portfolios and paperweights, to favorites like USB drives and mouse pads, our wholesale promotional products range from traditional to tech-friendly. Check out great little giveaways like magnets and letter openers, ideal for mass-market promotions. Shop wholesale promotional items from Gallant Gifts, where style comes with savings and the branding is the best! Custom Black/Gold Laserable Leatherette Clip Board w/Pen Holder, 9" x 12-1/2"
Custom Blue/Silver Laserable Leatherette Clip Board w/Pen Holder, 9" x 12-1/2"